Yeah, I’m pretty sure that car is still and the screen is the one moving. Doesn’t matter really though. 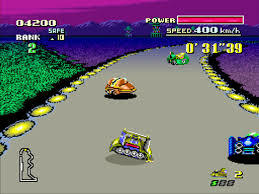 F-Zero began as a launch title on the SNES, one of which showed off the capabilities of the shiny new console. Mode 7 texture mapping allowed the console to give the impression of 3D environments and F-Zero, shortly followed by Pilotwings, were rolled out to show the world this wondrous feat. The game felt fast and fresh and really let the new console live up to its Super name. However since being such a big title for Nintendo’s big 16-bit generation, what has the series been doing since? Boy that thing sure it clunky! The Satellaview ladies and gentlemen. While the F-Zero franchise has seen subsequent releases since its debut, a lot of the support for it may have gone somewhat unnoticed. 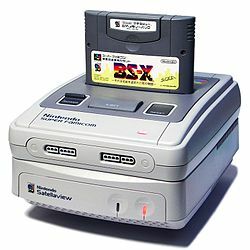 The original game received a couple of sequels/expansions via the Satellaview, an add-on for the SNES which allowed players to download additional content to their system via satellite radio. BS F-Zero Grand Prix and BS F-Zero Grand Prix 2 never saw life outside of Japan due to the failure of the Satellaview and thus F-Zero between 1990 and 1998 went quiet for the rest of us. However what’s interesting about these releases is that they pre-date the DLC we are now so used to getting today. F-Zero, like many other Nintendo franchises, was a couple of decades ahead of the time; only sadly it was ahead too soon. 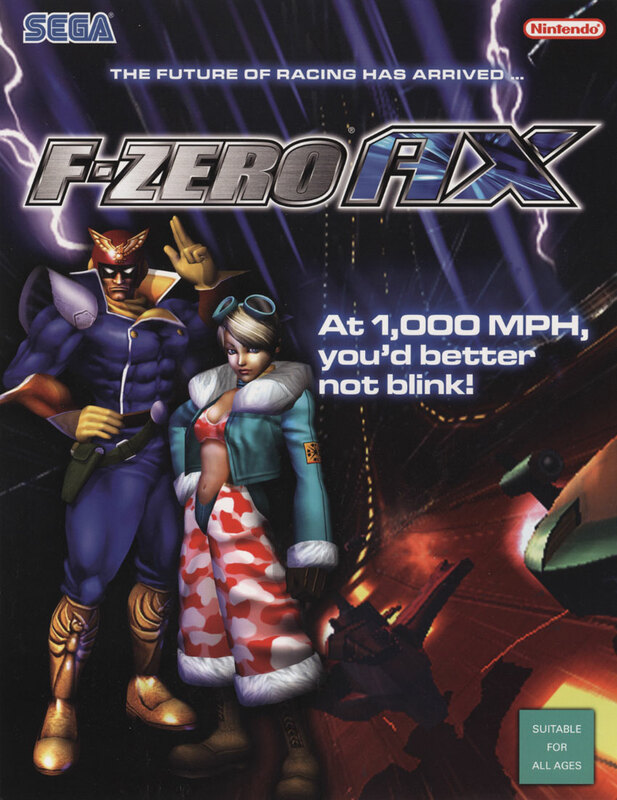 The series finally received a full 3D sequel in 1998 with F-Zero X on the Nintendo 64. Interestingly enough the main characters returning from the original game received their first in-game debut here, alongside a much greater racing roster than before. This game introduced more gameplay modes while retaining the learning curve set out in the original. Like the original this game also received an expansion via another failed add-on, the 64DD. Not only did this expansion give players access to new tracks, but added car, track and cup editors, making this game one of the most customisable racers ever to be released. Sadly the 64DD was also a failure and never saw life outside of Japan and thus once again support for the series went somewhat unnoticed. Yes that is Sega and Nintendo on the poster. You could also bring you GameCube memory card with F-Zero GX save data to plug into the arcade unit. Since then two more main series titles have been released. First F-Zero Maximum Velocity, released for the Game Boy Advance in 2001, took the series 25 years in the future and featured an entirely new cast of characters. Then Nintendo released F-Zero GX on the GameCube in 2003 and this title is still considered to be the best in the series to date. While customisation wasn’t so comprehensive as in the F-Zero X expansion kit it still featured to some extent in the new title. However in its stead the game introduced a story mode which finally put Captain Falcon in the spotlight after being the poster boy of the series since its creation. However while the game did not receive similar expansion kits its predecessors did, it too experimented with something new with its arcade counterpart F-Zero AX which marked the first significant collaboration between Nintendo and Sega since the latter left the console market. Thus the series’ trend to try something new continued cementing F-Zero as one of Nintendo’s most experimental series in history, at least from a development point of view. And that’s really where things end… Aside from two Game Boy Advance titles in 2003 and 2004 which were based on the F-Zero GP Legend anime, the series has gone quiet. No future releases are planned (check here) and thus F-Zero is likely to miss out on both the Wii and Wii U. However is it likely the series is over for good? With Mario Kart 8 embracing the futuristic racing there are doubts and it seems Nintendo simply doesn’t have the time to work on a new entry in the series as of yet. That isn’t to say F-Zero has been forgotten, the Blue Falcon, Captain Falcon’s signature racer, has now appeared in two Mario Kart titles and the recent DLC packages for Mario Kart 8 have brought back classic F-Zero racing tracks Mute City and Big Blue to a newer audience (though why Captain Falcon hasn’t been added is beyond me…) Captain Falcon is also a fan favourite in the Super Smash Bros. series with his Falcon Punch considered one of the most recognisable features of the games. Thus with the F-Zero not forgotten, like Star Fox we may see it return but for now the future is unclear for Captain Falcon and the F-Zero racers. One thing is for sure, with a past that is filled with forward thinking ideas, there are certainly big shoes to fill when the series does eventually return. The triumphant return of Mute City! It’s a great Mario Kart 8 track to boot. If you want to see the track editor in F-Zero X in play, check this video out. The editor isn’t too dissimilar to the tools the developers used to make the tracks. 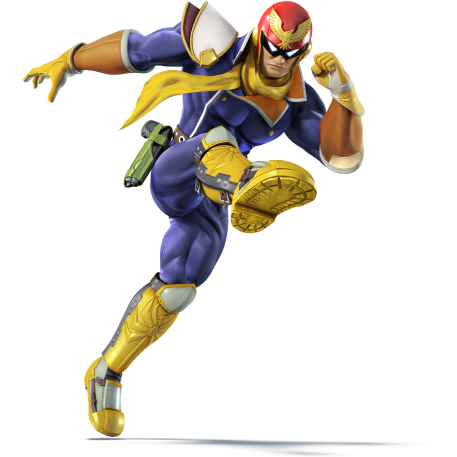 Captain Falcon is one of the perfect attendance crew in Super Smash Bros. who made his debut in the first F-Zero game, albeit only within the manual. His Final Smash, the Blue Falcon, appeared in his place in-game instead. His rival Samurai Goroh has appeared as an Assist Trophy since Super Smash Bros. Brawl. While stage locales Mute City, Big Blue and Port Town have all appeared in F-Zero since the first game, only the Mute City stage from Super Smash Bros. for 3DS is directly based on a track from the original SNES title.